As I recently noted, I was a big fan of the US Space Program in the 1960s as it inspired me and many other kids as to what we and our country could do when we got together. In 1964 I went into a drug store to pick up a magazine and found the original version of this kit sitting on their shelves (models were far more common in the 1960s than they are today) for $1.29. This was one of the most detailed kits to come out on spacecraft in the mid 1960s and a really fascinating model as it also came with a booklet about the Mercury and Gemini programs. As both programs were relatively mature (Mercury was over and Gemini just starting) Revell got top-notch cooperation on both of the spacecraft kits in the box and even got some things that were never used, such as the landing gear for the Gemini capsule (that was supposed to use a type of parachute that looked like a big paper airplane and land on the ground, not water). I picked up this re-release in 1996 and have held on to it for 15 years, but now Revell is preparing to re-release it once again this spring or summer. Alas, they no longer add the little booklet, but at least in its 1996 version they DID keep the original directions. These cover detailed assembly and painting directions as well as call out the names of each of the components, which is a good thing with the relatively complex Gemini capsule. Both spacecraft come complete in their “launch” configurations with the escape tower and rocket motors in place on the Mercury, as well as both their retro rocket assemblies. 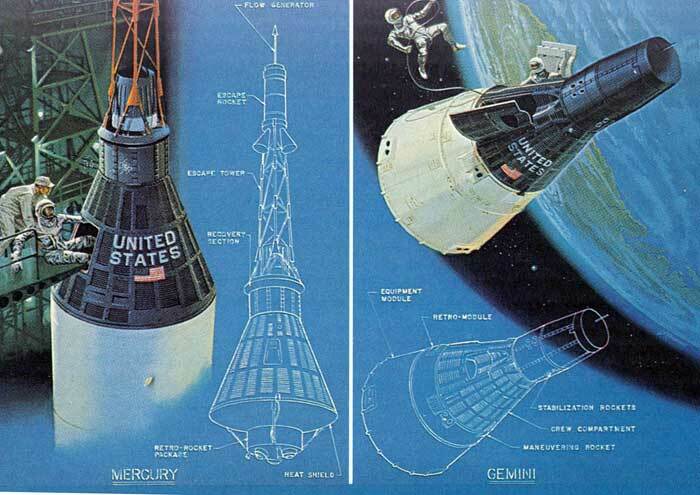 While the Mercury capsule comes with a loose-fitting hatch, those of the Gemini are hinged (as in real life, as the Gemini capsules were used for the first US space walks and the astronauts had to get out and in again). Both spacecraft come with a short stand using a modified version of the famous “Revelling Ball” mount which Revell offered on its aircraft kit for many years. But these are grey plastic and only about two inches high. As none of the Gemini missions had flown before the kit was released, it only comes with generic UNITED STATES and flag markings. The Mercury capsule comes with markings for “Freedom 7", “Liberty Bell 7", “Friendship 7", “Aurora 7" and “Sigma 7". Overall, now that Revell has re-released the Apollo Lunar Spacecraft kit (85-5090) in this same scale, modelers can now put the first three American spacecraft projects together in one display.